Cut chicken into small bite-size pieces. In 12-inch nonstick skillet, heat oil over medium-high heat until hot. Add chicken; sprinkle with taco seasoning mix. Cook 5 to 7 minutes, stirring frequently, until chicken is no longer pink in center. Remove from heat; cover to keep warm. Meanwhile, in small microwavable bowl, mix peanut sauce, red curry paste, lime juice and sugar. Microwave uncovered on High 30 to 40 seconds or until warm. Stir thoroughly until all of the curry paste is dissolved. Heat tortillas by placing one at a time in 10-inch nonstick skillet or on hot nonstick griddle on medium-high heat 3 to 5 seconds, turning once. 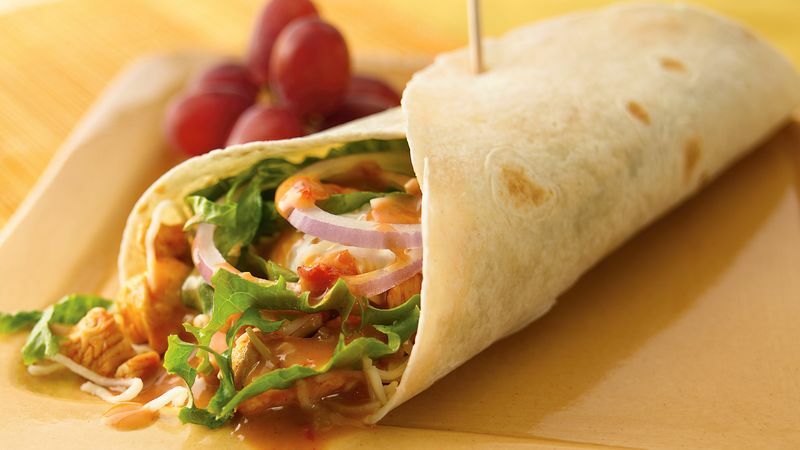 To assemble each wrap, spoon about 1/2 cup chicken mixture down center of 1 tortilla. Top with sour cream, cheese, lettuce and onion. Drizzle with generous 1 tablespoon curry-peanut sauce. Fold 2 sides of tortilla to the middle; secure with toothpick. Serve warm.